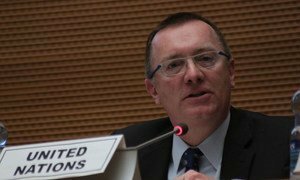 The Kenyan Government and the international community must significantly scale up their efforts to prevent internal displacement resulting from possible violence ahead of the general election next week, a United Nations independent expert stressed today. “Instances of localized violence likely to result in the arbitrary displacement of persons in Kenya have steadily increased in the run-up to the elections, although intervention by Government has helped to improve the situation,” said the Special Rapporteur on the human rights of internally displaced persons (IDPs), Chaloka Beyani. Internal displacement in the country has historically followed each election cycle since 1991/1992. The previous general elections were held in December 2007, and were followed by post-election violence in which more than 1,100 people were killed, 3,500 injured and up to 600,000 forcibly displaced. This year’s elections are the first under the new 2010 Constitution, which introduced major political reforms after the last post-election violence. According to the Office of the High Commissioner for Human Rights (OHCHR), the root causes of past displacements have been mitigated by the new Constitution. However, challenges remain, including the slow pace of the implementation of the Constitution as well as increasing ethnic tensions in the country. “I urge the Kenyan authorities this time around to strengthen the measures being led by national disaster and crisis management to prevent displacement, together with its national and international partners, and to intensify emergency preparedness and coordination efforts to that end,” Mr. Beyani said, calling on donors in particular to support preparedness efforts that will ensure the safety and dignity of IDPs in the possible event of displacement in the country. Mr. Beyani commended the Government for the progress it has made since his last visit in September 2011. Since then, the Government has facilitated returns for IDPs and adopted the IDP Act, which seeks to assist and protect displaced communities. Mr. Beyani also warned that inter-communal tension increases the risk of violence at a local level after the elections. Last year alone, more than 116,000 persons were displaced as a result of inter-communal violence in the country. The United Nations political chief today stressed the need for all Kenyans and their institutions to ensure the upcoming general elections in March are credible, peaceful and transparent.